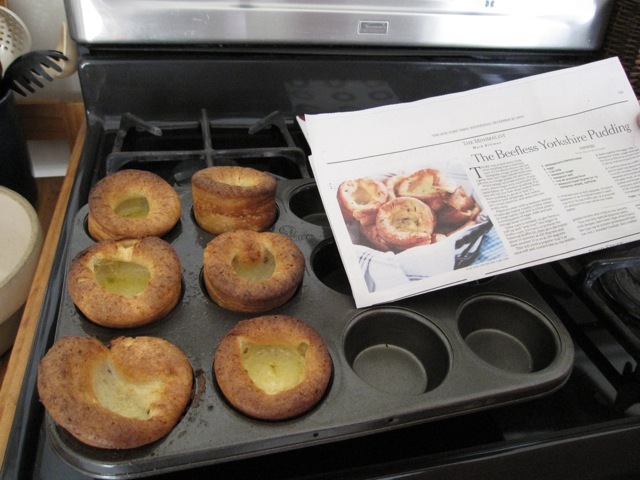 Charlie saw Mark Bittman's recipe in the New York Times on December 18, 2009, for The Beefless Yorkshire Pudding. The American name for Yorkshire Pudding is ... popovers. Charlie's mother made them frequently when he was young. He has made these many times since finding the article. However, he has modified the recipe to work in mile high Albuquerque. He said: I changed Mark Bittman's recipe for the higher altitude in Albuquerque, that is, more liquid. Four eggs instead of two, 1 1/4 cups of milk instead of 1. This makes a fairly thin batter but it works well. I halved the salt to 1/2 teaspoon since they seemed too salty to me. I often make a half recipe. I got a popover pan from Amazon. It has cups that are thinner than a muffin tin, like half the diameter. These work very well. The ingredients should be at room temperature and this means mainly the milk and eggs since the others are stored at room temperature. I often put a container of milk and the eggs in warm water to warm them up quickly. Be sure not to overfill the cups, big cups 1/3 full at most and thin cups 1/2 full. A full recipe makes about 18 popovers if you are careful not to overfill the cups, it is much better to have more, fluffy ones than overfill and have fewer flat ones. The butter burned when I did it Mark Bittman's way. I heat the muffin tin to 425 and microwave the butter to melt it. When the batter is ready spoon a teaspoon of the melted butter into the cup and immediately add the batter. Do all the cups quickly and get them back in the oven. The original recipe calls for 425 for 15-20 minutes and then 350 for 15 minutes. However, I found they burned. I just do 15 or 20 minutes at 425 and they seem done. If I do all these things they never fail to "pop over" and rise way over the top of the cups. Here's the original New York Times recipe. Here's a PDF copy of the New York Times recipe in case the above link goes away or for those who don't want to sign up on the NY Times site.